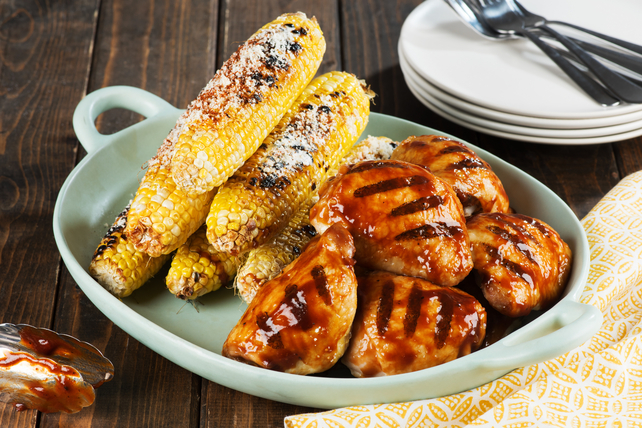 Grill up our wood-smoked barbecue chicken thighs and a side dish of charred corn - just follow our simple steps to barbecue greatness. Immerse planks in water, placing weight on top of each plank to keep it submerged. Soak 4 hours. Heat barbecue to medium heat. Reserve 1 Tbsp. oil for later use; rub remaining oil, then garlic powder evenly onto chicken. Remove planks from water. Place 3 chicken thighs on each plank; place on barbecue grate. Grill 28 to 30 min. or until chicken is done (165°F), turning occasionally and brushing with barbecue sauce for the last 10 min. Remove chicken from barbecue; cover to keep warm. Brush reserved oil onto corn; grill 4 min. on each side or until corn is tender and well charred. Remove corn from barbecue; brush with Miracle Whip. Sprinkle with cheese and chili powder. Serve with chicken. Remove skin from chicken thighs before serving. Cedar planks can be soaked up to 24 hours before using as directed. The easiest way to ensure that cooked meat or poultry is done is to check the internal temperature. Using an accurate food thermometer will take away the guesswork. Simply insert the thermometer into the thickest part of the meat or poultry, avoiding any bones if present. For whole poultry, insert the thermometer into the thickest part of one of the thighs, again taking care to avoid any bones.